The Woods of Windsor Shaving Soap is a traditional style shaving soap formulated to provide a gentle and smooth shaving experience. It has the signature Woods of Windsor scent which is inspired by Spanish orange groves and spices, containing citrus notes of lemon, orange and vergamot with subtle hints of nutmeg and clove combined with a herbal heart and warm base notes of oakmoss and patchouli. This exclusive shaving soap comes in a classic ceramic shaving mug which is great for lathering. So lets have your impressions on this soap. Scent and lather and slickness.... Shoot me straight. I don't mean "it lathers ok". Everything that I have and use must explode with lather. I like soaps and creams that almost lather themselves!! One of my favourite soaps! I even have a backup of it. Too bad it is not produced any-more. 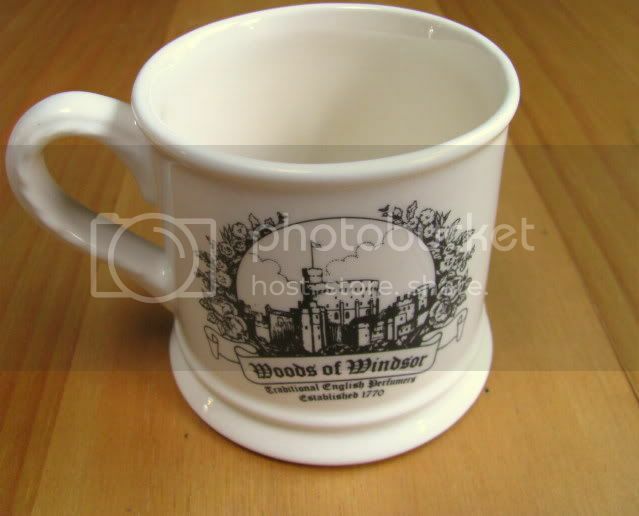 I also have a vintage shaving mug from Woods of Windsor. There is one interesting fact about the Woods of Windsor shaving soap: the refills are always the tallow version. The mug version can be the tallow (an outstanding soap) or the veggie version (not so good, but still nice - some people find it poor). 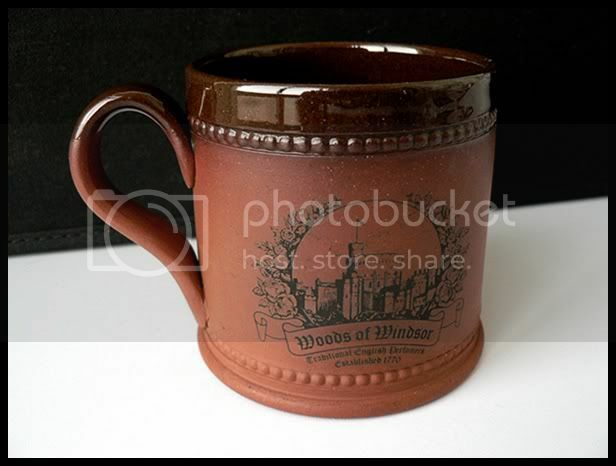 The mug itself had different versions through the years. Thick lather with lots of cushion and glide. Just love it. (03-31-2012, 03:14 PM)oversaturn Wrote: One of my favourite soaps! I even have a backup of it. Too bad it is not produced any-more. Sweet. I think I'll get some!! Is there just one place to buy? thx...l think it is still there in tallow. I would say that this one is the veggie version. But I may be wrong. You probably should send an e-mail to them to ask that directly. My pucks came from a German webshop called rasierladen, but I believe that doesn't make much sense for someone in the USA to order from them - the shipping costs would be too much. The first ingredient says tallow?? I might be misunderstanding something here?? I have seen vendors list the same ingredients for the refills and the soap in the mug even though they do not have the same ingredients. (03-31-2012, 04:07 PM)bullgoose Wrote: I have seen vendors list the same ingredients for the refills and the soap in the mug even though they do not have the same ingredients. Is it then safe to say the refill has tallow? I'll ask them. Yes, the refill is always tallow. If you find the refill, buy it. Exactly. Many vendors do that mistake. I've seen it several times. For example, Rasierladen in Germany had both the puck and the mug listed as "veggie". Well, there is no "veggie" refill, that doesn't exist - so I contacted them (I organised a group-buy there for the Portuguese forum), and then they noted the error and changed the site. Send an e-mail to Royalshave and ask them to check the package - it could be just another of those errors. (03-31-2012, 04:11 PM)oversaturn Wrote: Yes, the refill is always tallow. If you find the refill, buy it. I would like to try this it sounds like it would smell very nice, but I don't have a lot of faith in veggie soaps. If there is a way to get a tallow refill I would. Does Royall shave have the refills again? They had been sold out and the refills were discontinued. If they have the refills, definitely buy it. The WoW soap refill is out of stock at Royalshave and the wait list link has been there for months. I signed up for the wait list some time back - no restock. Oversaturn : maybe Im wrong,but I remember seeing both the veggie and the tallow version refills in Spain (El Corte Ingles).However I only saw the veggie version with the mug last time I was there (february 2010). WoW its a really good performer when we talk about the tallow version (It reminds me of a little bit or Erasmic tallow stick) and some people say that are two veggie versions : one that can be use (stable lather) and other that cant be use (no lather at all).I tried the tallow version,many,many years ago since it was available in El Corte Ingles in Spain and my father still has the WoW mug (the 3rd one on Oversaturn's post). WOW went into receivership @ 3 years ago. Remaining stocks were quickly snapped up and EBAY was scene to inflated prices and fierce bidding wars on the AS and Cologne. Another concern bought the company and dropped the men's line. They resurrected the scents- badly with the substitution of patchouli. The soap could be had in tallow and two veg formulations. One of the veg was also awfull and if you can use it at all will suddenly 'go flat' halfway throughthe puck. WOW soap also tends to dry out and crack very badly in this version. Royalshave has the refill in stock. Those are some great looking mugs Emanuel! Especially the first one. I have some of the old preparation of the soap, and it is very, very good. (03-31-2012, 06:49 PM)Sully Wrote: Royalshave has the refill in stock. I think it says that it is out of stock. I check EBAY periodically and all the old stuff is gone. You can get the old AS formular from a UK vendor called PERFUME-HEAVEN @ $40 odd including shipping with 10 bottles left. That Fulham version would be lovely with my SADLER Brown Betty. Was it expensive? You're right it does. I don't know if it was listed as out of stock when I posted the link or not.